Bangles, also known as Kangan or Churiyan in the Indian Subcontinent, are one of the most popular pieces of jewelry worn by women of all ages. 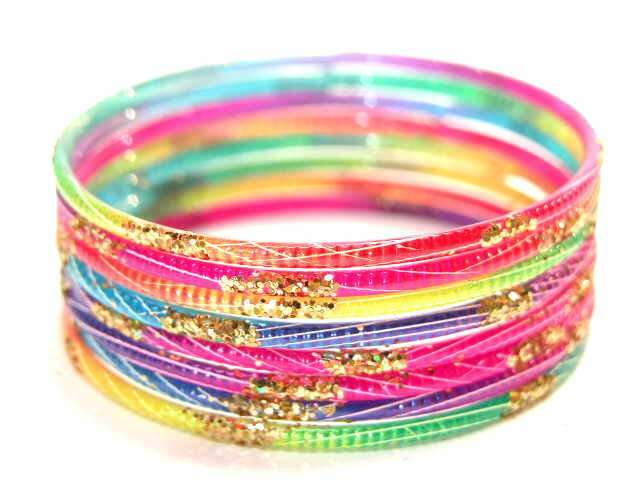 Bangles come in different colors and are styles; owing their form to the region they belong to. 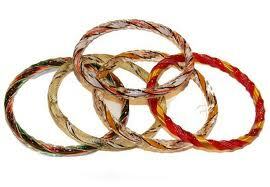 Bangles are worn by married, unmarried, young and old women. In many cultures a single bangle is given by the bride to her groom as a symbol of everlasting relation, such is called Kara. It is a circular shaped bangle having religious significance and is made from iron, white metal or gold. In India and Pakistan, bangles have become very popular. With the increasing fashion trends, now they are available in various designs and forms and no longer just made in a circular shape with glass. 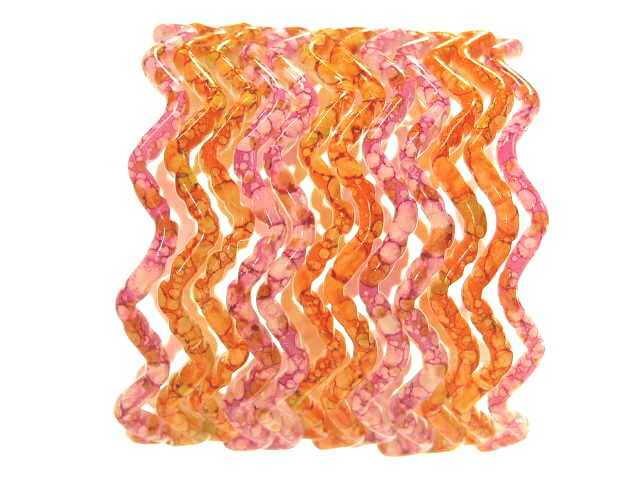 Bangles are made from a range of materials and can be found in many shapes such as round, rectangular or square. Women wear bangles in colorful pairs in both arms which enhance beauty of women who wear them in a special traditional way. They are made not just from glass but also gold, silver, wood, ferrous metals, plastic and rubber are among other materials that are used extensively to make bangles. In Pakistan, the single largest producers of glass bangles come from Hyderabad, Sind.Undoubtedly, bangles complement the dress of a women. Wearing bangles or chudiyan is like adding one more feather to your cap. The best part about bangles is that it can be worn with any kind of dress. However Indian bangles are mainly worn with skirts, sarees, suits, salwar kameez, lehengas. Right from an early age young girls have an undying crazy for bangles. However, a different variety of Indian bangles are found in the market.Most Indian women prefer wearing either gold or glass bangles or both in combination. Bangles made from plastic are slowly replacing those made by glass, but the ones made of glass are still preferred at traditional functions such as marriages and at festivals. Gold bangles are most popular with Indian women. They range from plain and simple to extremely artistic and intricate. They are often studded with precious and semi-precious stones such as diamonds, gems and pearls.Since most wood bangle stands can only be found and purchased online, finding a quality wood bangle stand can pose a challenge.